This is one of those forecasts I hate to make and I sincerely hope is completely wrong. 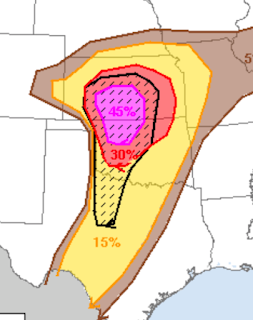 Before I go further, tornado forecasts are not a cause of worry or concern, they are a call to action. So, here is the forecast. In south central Kansas, including Wichita, there is a 30% chance of a tornado within 25 mi. of a given point. The hatching means the tornado could be violent. The signifiant threshold is 5% (brown). If you live in the 5%, or higher areas, please monitor the weather for any tornado watches and then for the first sign of a thunderstorm. Consider taking family heirlooms to your shelter now. Consider postponing little league games. Making plans now for sheltering any infirm friends or relatives. Put your car in the garage or under the car port due to the risk of giant hail (see below). Secure items that can be blown about. Wouldn't hurt for you to get some extra cash from the ATM and fill your fuel tank. Plan to take any prescription drugs to your shelter. Wear shoes to shelter in case the worst happens. If you don't have underground shelter, make sure there is room in an interior bathroom or closest in the middle of the house for your family. Download the free AccuWeather app and allow it to use your location. It is a great extra warning tool. Can this forecast be wrong? Yes! 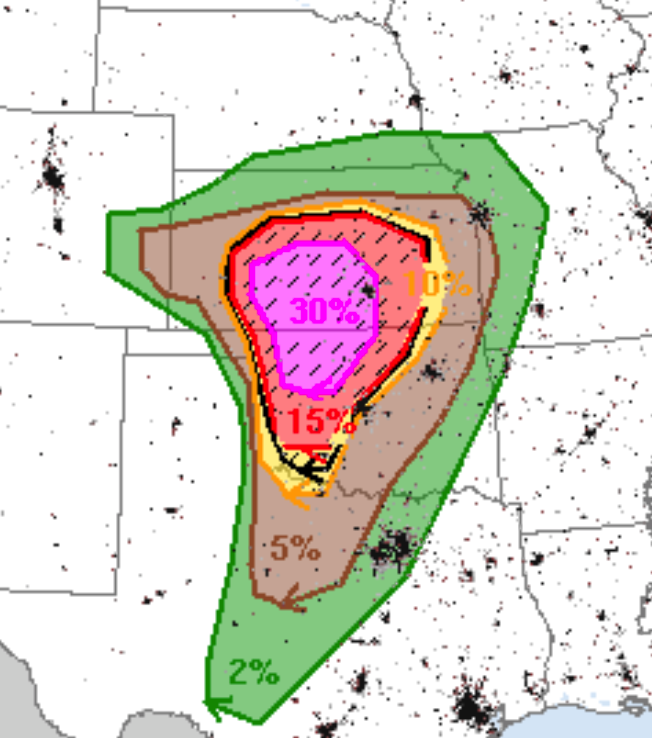 There is a possibility Mother Nature will create too many thunderstorms for large tornadoes to occur but there will still be a threat of smaller tornadoes and damaging winds. So, these precautions are still worth taking. You may recall I mentioned hail. The 15% (yellow) is the significant threshold. The hatched area is where large or even a few giant hailstones may fall. I will update again around noon (different schedule than I originally thought). Late addition: There is a chance of flash flooding. You may want to limit your driving even after the tornado/hail threat has passed. Don't worry, we've been through this before many times! Please add pets to your list of things to have a plan for / take to shelter in advance!